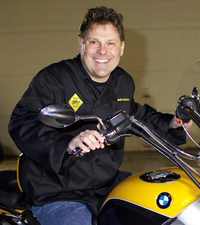 Seth Diamond is the host and executive producer of Food Biker, a culinary motorcycle web/TV show currently in production. 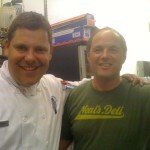 On Food Biker, Seth motorcycles around America, cooks with other chefs, and meets with experts in both the food and beverage worlds. In 2008, Seth pursued his passion for the culinary world professionally, directly applying both his creative multimedia background to culinary media and his science background to the professional kitchen. In 2010, Seth graduated Le Cordon Bleu College of Culinary Arts with high honors and both an A.A.S. degree and Diplôme. By interning on both Season 7 on PBS’ Simply Ming (2009) and Season 11 of PBS’ America’s Test Kitchen (2010), including a spring externship at the latter, Seth continued to master culinary techniques, while learning the culinary media and production skills required to take “Food Biker” from idea to reality. After completing many winetasting and bartending classes over the years, Seth passed the Court of Master Sommeliers Introductory Examination in 2009 and has been a member of the Boston Sommelier Society. Seth’s background includes creative multimedia, IT, entrepreneurship, and science. 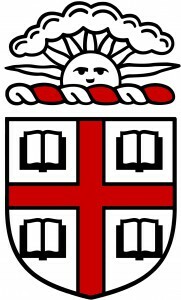 Seth graduated Brown University with a B.A. in Biology, and he went on to perform both academic and industrial lab research, followed by attending medical school at the University of Cincinnati College of Medicine. Seth fell in love with his first motorcycle and Midwestern back roads, and voluntarily left during his third-year clerkships to found a few small businesses, in what eventually became divisions of the Black Diamond Group, LLC and Complete Breakfast Productions. In 2008, the economy tanked. Like so many Americans, especially those approaching the age of forty, I faced some difficult career decisions. Business for my Mac computer consulting business of nearly 15 years nearly dried up, and both retail and web sales for my graphic-design and e-commerce driven apparel and gift company plummeted. For me, 2008 was a double-whammy. 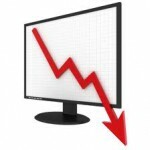 However, this economic downturn wasn’t the end of the road. Instead, this challenge was what kick-started a shift in my career. Meanwhile, the siren song of the open road was calling. 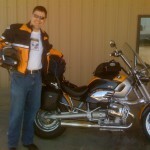 In early 2008, I had bought a one-way ticket down to Pensacola, FL, to purchase a used 2002 BMW R1200C Phoenix motorcycle. Carrying an old helmet, a backpack, old leather motorcycling boots, and some second-hand textile gear… I rode a 1700 mile solo journey back home to Boston… eating incredible road food and exploring the back roads of the South- and Northeast. It was during this journey, that I soon realized that trip was one of my most life-defining events. Although insanely passionate about cooking, beverages, and food adventures since childhood, never before had I allowed myself to seriously consider a career in the culinary world. 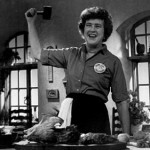 Later in 2008…Inspired by Julia Child, Alton Brown, and Michael Ruhlman… all of whom attended culinary school in their thirties and successfully moved into culinary media, I figured that all three of them must have done something right. So, off I went to school at Le Cordon Bleu Boston to become a culinary professional. Upon meeting Anthony Bourdain and briefly discussing my career change in early 2010, Bourdain playfully gave me a hard time…calling me “Methuselah… Grandpa…” for having jumped into culinary so late in my life. However, Bourdain explained to me that he did see places for me in culinary media, where I might find my own “mad butcher” like Bill Buford had in his book Heat. Little did Bourdain know that I was quietly working on Food Biker in the background, where I was planning to find and learn from “mad butchers” all across America. In the spring of 2009 and during my education at Le Cordon Bleu, I undertook my second solo motorcycle journey, riding down to Skyline Drive and the Blue Ridge Parkway…down to Beaufort, SC…up the Outer Banks…and looping back home. This time, I packed my clogs, chef whites, checks, and knife roll…and enjoyed day stages with various incredible chefs while covering 2,500 miles on Ellabelle. This was it! Learning the secrets from chefs while enjoying the motorcycle adventure became the mission itself. Thus, Food Biker was born. Here’s the travelogue-inspired timeline behind Food Biker. 1962 – John Steinbeck shows us the faces of America in Travels With Charley, one of the seminal American travelogues of the twentieth century. Steinbeck drives a GMC truck and camper he names “Rocinante,” after Don Quixote’s horse. 1969 – Dennis Hopper and Peter Fonda star in Easy Rider, widely regarded as the first independent film, chronicling a fictional road trip from California to Louisiana. Both motorcycles were custom choppers made for the movie. 1974 – After 121 rejections by publishers, John Persig publishes Zen and the Art of Motorcycle Maintenance, a best-selling novel, based on a true philosophical and spiritual motorcycle journey taken in 1968 from Minnesota to California. Admittedly this important work fixes on philosophy, the road-trip inspiration still exists. Persig rides a 1964 Honda Superhawk CB77, and his friend rides a BMW R60/2. 1996 – Two Fat Ladies debuts on BBC, a series chronicling the adventures of two women in a motorcycle and sidecar, as they joyfully cook their way around the U.K. (and Ireland in one episode). The ladies sport a Triumph Thunderbird, coupled to a Watsonian GP-700 “doublewide” sidecar. 2004 – Ewan McGregor and Charlie Boorman film The Long Way Round, a mini-series adventure around the world longitudinally on BMW R1150GS Motorcycles, exploring cultures all around the world. 2004 – Hairy Bikers debuts on the BBC, telling of the encounters of two BMW riders who cook and travel around the UK. The gents sport a BMW R1200GS, a BMW F650GS, and a Triumph Rocket III. 2006 – Alton Brown films Feasting on Asphalt, a mini-series chronicling his culinary motorcycle trip from South Carolina to California. Brown sports a BMW R1200RT. 2007 – Ewan McGregor and Charlie Boorman film The Long Way Down, a mini-series adventure from Scotland to South Africa on BMW R1200GS Motorcycles. 2007 – Alton Brown films Feasting on Asphalt: The River Run, a mini-series chronicling the culinary motorcycle trip up the Mississippi River from Louisiana to Minnesota. Brown sports a BMW R1200GS.